When Floyd Mayweather Jr. fought Miguel Cotto on May 5, 2012 at 154 pounds, he was at a tumultuous period, a veritable crossroads, in his life. Mayweather, the WBC champ, had only fought four times since he left the sport in late 2007. More importantly, Mayweather was preparing himself for a brief jail stint for misdemeanor domestic violence and harassment charges that would begin June 1. Distractions outside the ring never seemed to deter Mayweather; in fact, they often motivated him and forced him to turn inward and sharpen his ring focus. Flitting in and out of the conversation as one of boxing’s elite fighters, Cotto, 37-2, 30 KOs, who had been drubbed by Manny Pacquiao, but had recently revitalized his career in a rematch with Antonio Margarito, had been heralded by Pacquiao himself as a real threat to Mayweather’s 42-0 record. Needless to say, Cotto presented problems for Mayweather that fight fans hadn’t anticipated. At times during the bout, Mayweather looked anything but the most accomplished boxer in the world. It was unlikely that Mayweather was overly concerned about getting hit too often by the slower Cotto. But in the first round, Mayweather had difficulty coping with the quick jab that Cotto would shoot upwards after setting it up by ominously shaking both hands in front of Mayweather’s face as a distraction. To his credit, Cotto, at the very least, landed four straight right hands to end the round. Too aware of the mistakes he made during the previous round, Mayweather didn’t wait to load up on those powerful right hooks that landed directly behind Cotto’s guard in round two. However, the real storyline wasn’t Mayweather’s aggressive start, but that Cotto was too big to tie up and too intelligent to take advantage of when Mayweather beckoned him to the ropes. Pushing Mayweather to the ropes in the second, Cotto reverted to a percussive body attack which opened up a left hand that landed cleanly. Yet, Cotto, not adept at using much head movement, watched as Mayweather ramped up the attack to end the second round on his own terms. 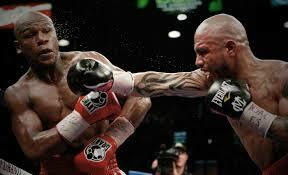 Counterpunching effectively with his jab in the third round, Cotto started to pile up points. Cotto’s jab was unique in the way he pushed it out with speed and accuracy. If Manny Pacquiao analyzed that round, he saw that if a fighter can counterpunch well off the jab and fight effectively going backwards, he can be successful in spurts against Mayweather. Mayweather wants his opponent to come forward; he wants his opponent to charge at him and take risks, but when a skilled fighter like Cotto slows the pace down, it’s more difficult for Mayweather to adapt. After getting hit too much for his liking in the third round, Mayweather whipped a lead right hook (as if hurling a football helmet), and then another right behind it in the fourth round. One can spend the entire day debating how dangerous Mayweather’s straight right is, but few fighters can avoid the wide right hook that comes in with more power and precision than that right hand. Cotto felt the brunt of it time and again in the fourth round. With the exception of a flurry against the ropes by Cotto, Mayweather dominated with, by his standards, a fierce attack. Jamming him in the fifth, Cotto aggressively jumped on Mayweather against the ropes, but Mayweather surprisingly fought back off of them. However, Mayweather couldn’t defend against one of the more potent left hooks he had absorbed in his career. Cotto’s winning combination started with the impressive left hook followed by a jab. Nevertheless, something unusual was occurring in the bout. 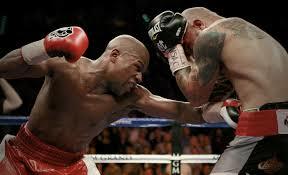 Cotto was tacking on points, and in the sixth Cotto did not wait for Mayweather to reset as he hooked off of his jab. Even when Mayweather appeared ready to return fire, Cotto instinctively grabbed him and waited for the round to wind down. What was so frustrating to Mayweather was Cotto’s resilience; at this point in most of his bouts, Mayweather had meticulously examined every opponent and decided how he would defeat him. By the eighth, Cotto had asserted himself and earned Mayweather’s approval: He was a legitimate opponent. After a four-punch combination in the round, Cotto positioned his head on Mayweather’s right shoulder and just stuck it there. There was not much Mayweather could do in return. Yet, as round ended, Cotto stepped aside and landed a big left hand that forced Maywweather to shake his head. Even Mayweather couldn’t hide his distaste for what was occurring, as the head shake only clarified his personal disgust. Two out of three judges awarded the round to Cotto. The strategy had worked, but as opponents dissipate, Mayweather gains strength. Although Mayweather takes breaks in his fights, he never tires. However, the Cotto fight was an exception. As the final four rounds began to unfold, the Mayweather, mouth wide open, looked exhausted and instead of moving and firing that right hand, he was forced to stay in the trenches. It was not the Mayweather that everyone had become accustomed to. In the ninth, Mayweather landed the right hand over Cotto’s jab, and slipped in an uppercut inside as most of the round featured both men trying to outmuscle the other. Few significant punches landed, but a little hop step by Cotto at the end of the round reminded Mayweather that he was still there and in the fight. The crowd responded accordingly. Crouching from the brunt of a right hand, Cotto struggled early in the tenth and the problems continued throughout the round. Mayweather bounced again and with the movement came a second wind and newfound confidence. If Pacquiao cannot match Mayweather’s rejuvenated surges that he exhibits in the later rounds, he will be at a severe disadvantage. Cotto ended the round with a spirited left uppercut that recharged his crowd, but there was not much else to be excited about. The men traded combinations and hooks in the last minute of the eleventh and headed to the final round. It was Mayweather’s toughest challenge. Although Mayweather had difficulty against De La Hoya, he was in a legitimate fight against Cotto going into the final round. What’s more, Cotto was still landing, still physical (disrupted Mayweather) and, at the 2:30 mark, still throwing combinations. But it was not his show to close as Mayweather blistered him with a devastating uppercut and several three-and-four punch combinations. As the fight ended, the fighters embraced, and Mayweather would later exclaim, “You’re a hell of a champion. You’re the toughest guy I ever fought.” The scores – 118-110, 117-111, 117-111 – were not indicative of how close the fight was. Well, if Pacquiao watches this fight, he sees the opportunity to steal rounds with activity and accuracy. Cotto is not as fast as Pacquiao, but he never stopped throwing his jab. I doubt Pacquiao will be as effective and consistent with his jab, but Cotto was able to time Mayweather like no other fighter. He utilized the perfect strategy and balance of physicality and finesse, but could not sustain the gameplan for 12 rounds. There were times that Cotto fought Mayweather perfectly against the ropes. He never gave him space, pushed him around at times, and very rarely allowed him to create space and counterpunch. Mayweather is so strong that it will be difficult for Pacquiao to successfully position him against the ropes, but that right hook is going to change the dynamic of the fight against Mayweather. I would be surprised if Pacquiao was not planning to set double up on those hooks to the body and head in the corner. Either way, with little more than a week left, it is going to be an historic matchup.